One year health guarantee, mandatory spay/neuter contract. Our Australian Terriers are from Championship bloodlines. Our goal at Broshko Breeders is to produce the best Australian Terriers possible in every litter for both temperament and confirmation. All of our dogs are bred to the CKC Standard. Our Australian Terriers are sought after for their great personalities, huge hearts, love for children, and depth of intelligence. The first of the Australian breeds to be in its native land, this breed made its debut in and was specifically designated as the Australian Terrier in . Though opinions differ, most historians agree that breeds used to create these rugged little dogs included the Dandie Dinmont, Skye, Yorkshire Terrier and the old Black and Tan (today?s Manchester Terrier) or their predecessors. The Irish and Cairn Terriers may also have been used. The Australian Terrier?s purpose in life was to help control rodents and snakes and serve as a watchdog. Tough, smart, alert, courageous with a healthy helping of self-confidence, the Australian Terrier is noted for being friendly and affectionate with humans. Though spunky and spirited, the Australian Terrier?s exercise requirements are easily met by the average owner. 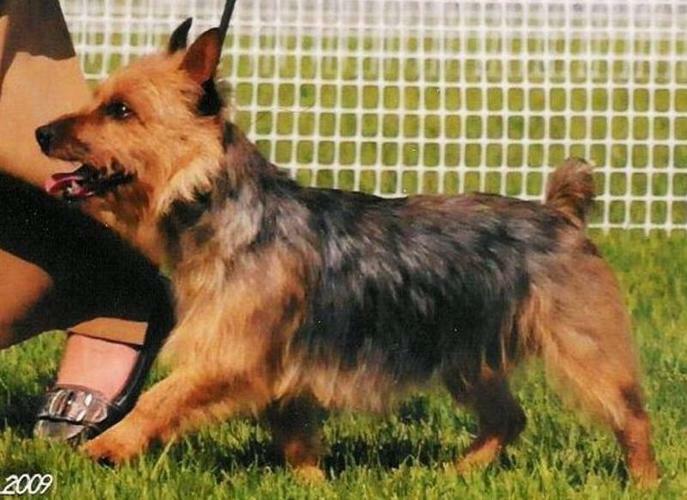 The Australian Terrier sports a harsh, straight outer coat about 2.5 in (6.5 cm) long with a distinctive ruff and apron. Below that is a soft and short undercoat. The distinctive topknot, covering the top of his skull, is soft and silky compared to the outer coat. The breed comes in blue-and-tan, solid sandy or solid red. The Australian Terrier is hypo allergenic and non-shedding, its coat requires minimal grooming. Small in stature, this somewhat longer-bodied dog measures about 10 in (25 cm) at the shoulder. The desirable weight is 14 lb (6 kg). Call to find out more today ! !